Arachnids (pronounced uh-RACK-nidz; class Arachnida) form the second-largest group of land arthropods (phylum Arthropoda) after the class Insecta. There are over 70,000 species of arachnids that include such familiar creatures as scorpions, spiders, harvestmen or daddy longlegs, and ticks and mites, as well as the less common whip scorpions, pseudoscorpions, and sun spiders. The marine horseshoe crabs and sea spiders are near relatives. Arachnids have paired, jointed appendages (parts that are attached to the main body), a hardened exoskeleton ( exo means "outer"), a segmented (divided into parts) body, and a well-developed head. Their body consists of two main parts: a fused head and thorax, and an abdomen. There are six pairs of appendages on the body: the first pair are clawlike fangs near the mouth used for grasping and cutting; the second pair serve as general-purpose mouth parts that may be modified for special functions; and the last four pairs of appendages are the walking legs. Most arachnids live on land and breathe by means of book lungs (socalled because their thin membranes are arranged like the pages of a book) or by tracheae (small tubes that distribute air from the outside throughout the body), or both. Most are flesh-eating predators. They feed by piercing the body of their prey and directly consuming its body fluids or by releasing digestive secretions that predigest the food before they eat it. Scorpions have large, pincerlike second appendages and a segmented abdomen that is broad in front and narrows to become taillike, ending in a sharp pointed stinger. The stinger contains a pair of poison glands with openings at the tip. The venom is neurotoxic (poisonous to the nerves) but, except in a few species, is not potent enough to harm humans. Scorpions have book lungs for breathing. They engage in complex courtship behavior before mating, and newly hatched young are carried on the mother's back for one to two weeks. Scorpions are nocturnal (active at night) and feed mostly on insects. During the day they hide in crevices, under bark, or in other secluded places. They occur worldwide in tropical and subtropical regions. In spiders, the abdomen is separated from the joined head and thorax by a narrow waist. The large and powerful first appendages of some spiders contain poison glands at their base, while the tips serve as fangs that inject the poison into prey. The second appendages of spiders are long and leglike. In male spiders, these appendages each contain an organ used to transfer sperm to the female. Some species of spiders have only book lungs for breathing, while others have both book lungs and tracheae. Spiders have organs called spinnerets at the tip of the abdomen that contain silk glands. The spinnerets draw secretions from the silk glands to produce fine threads of silk. These are used to build webs, ensnare prey, package sperm to be transferred to the female, and make egg sacs. Although all spiders produce silk, not all weave webs. Spiders have courtship patterns prior to mating that are quite varied. Spiders are found worldwide and live in many different habitats—in burrows in the ground, in forests, in human habitations, and even under water. Spiders are predators, feeding mostly on insects. Despite their reputation as fearsome animals, they actually benefit humans by keeping some insect populations under control. The bite of only about 30 species are dangerous, but rarely fatal, to humans. Most mites and ticks are very small, mites being microscopic and ticks measuring only 0.2 to 1 inch (5 to 25 millimeters) in length. The oval body of these arachnids consists of the fused head and thorax and the abdomen. The first two pairs of appendages are small and are used for feeding. Adult ticks and mites have four pairs of walking legs, but the larvae have only three pairs. Breathing occurs through tracheal tubes. engorged female may be three or more times her original size. The larval and nymphal stages likewise feed before they molt (shed their skin) and progress to the next stage of development. Ticks have specialized sense organs that enable them to locate a host more than 25 feet (about 7.5 meters) away. Many mites are parasites of birds and mammals. They can be ectoparasites, feeding on the outer skin, or endoparasites, feeding on the underlying tissues. The ectoparasites live on the host's body surface, while the endoparasites dig tunnels under the host's skin in which they live and reproduce. While some parasitic mites transmit disease organisms, many cause diseases themselves. These include scabies and mange—contagious skin diseases characterized by inflammation, irritation, and intense itching. Many more mites are free living, that is, not parasitic. 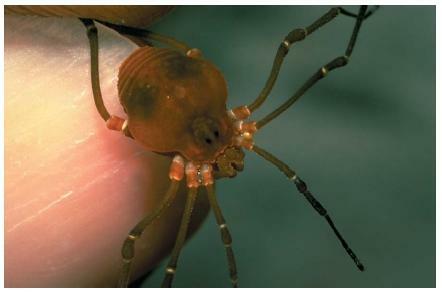 Some, such as the chigger, are parasitic as larvae but free living in the nymph and adult stages. Free-living house dust mites cause allergies in many people. Others can cause the destruction of stored grain and other products. Harvestmen, or daddy longlegs, look superficially like spiders but differ in many respects. They lack a waist separating the abdomen from the fused head and thorax, and their abdomen is segmented. They can ingest solid food as well as fluids. They do not produce silk and are non-poisonous. Harvestmen feed on insects and contribute to insect control, although they are less important in this respect than spiders. The information given here is very general and useful, but i would love to know about the life cycle of mites, their overwintering and their seasonal aboundance. Hey, this is very good information and curiousgeorge I thought that too! Hey this is really cool information and it's going to help me with my progect. I know with this information i will so get an A or even an A+! Thank you so much for the information! SO so so soHelpful THank you kindly.This Will help me much. I will Get an A+ on this report for sure! i thnk its a complete guide.really a good information for students and teachers in a precise way. This was very helpful would have liked a liitle bit more info but it was still very helpful. I would like to know what kind of testing is done when someone has spider ticks in their body and what happens. Desert tick spider black. I found this information to be very useful. It will definitely help me get an A+. I always look forward to finding good information to keep up my status of being a straight A student. Thank you for the information. i liked the picture...good on ya mate!!! lots of info highly help full. learnt something new. once again thanks!! !